Traditional Finnish food is quite simple and lightly spiced. Fish, meat and potato among with some root crops like carrots and Swedish turnips are often used. Salt and pepper are the most common used spices in Finnish food. In the past, when the people where poor and there was lack of almost everything, these dishes where economical and the supplies for them were always available. Today the food culture has changed dramatically from what it used to be. Pizza places have conquered the streets of Oulu. 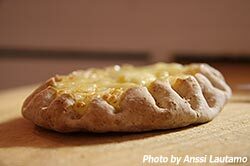 Actually it is said that Oulu has most pizzerias per inhabitant.